“Randy I have followed your advice on Savage muzzle loaders and done what you said to do to make them shoot better and it works. I have fixed several for me and my friends (I own three of them) thank you . There is no easy answer to this. “Benelli” is one of those brands that people seem to get really riled about. If you say you love a Benelli, half of the more ornery folks claim they hate you. If you say something that isn't flattering, the other half seems to lose their collective minds as well . . . particularly if they own one, as if merely owning something somehow makes it better or worse than it really is. So, Jim, it is a big hot mess. Over the years I've tested and evaluated countless Benelli models, numerous other brands made at the Benelli plant (Franchi) and the patterning results I've obtained are all extremely well-documented not just with piles of patterning sheets, but on video as well. Until the unfortunate SBE3, Benelli product has not had severe, egregious point of impact issues. In fact, at a laser-verified 40 yards, my Benelli Vinci prints no more than 1.02 inches high: https://youtu.be/4lLkh7NP5ig . 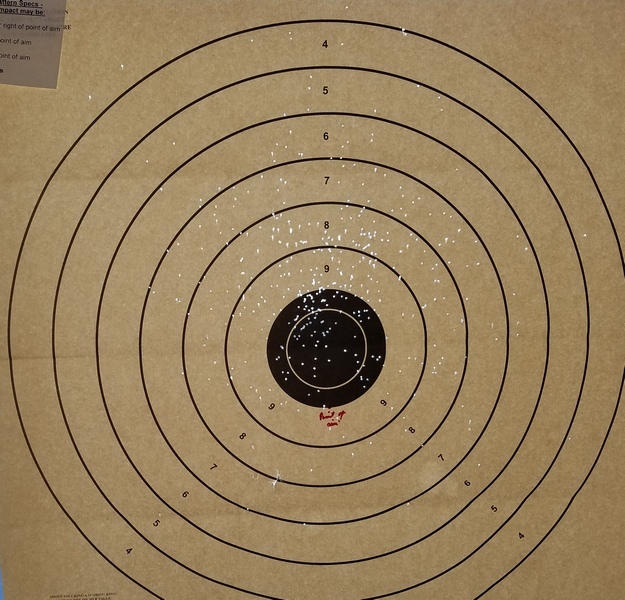 My M2 shoots to point of aim at 40 yards and so did my SBE2 for that matter. One can speculate that the only 20 shotguns Benelli ever made that shoot to point of aim at 40 yards were sent to me, but the chances of that are slim to none, and Slim just left town. A 60/40 pattern is 3 inches high, a 70/30 pattern is 6 inches high at 40 yards. This Benelli test target is "within parameters" according to Benelli. It is essentially a 100 / 0 pattern at just 21 yards, with almost all of the pellets hitting above the point of aim Benelli marked in red. While Benelli USA claimed this was acceptable and returned the shotgun to the hapless customer . . . this is totally unacceptable for any hunting shotgun, anywhere, made by anyone. 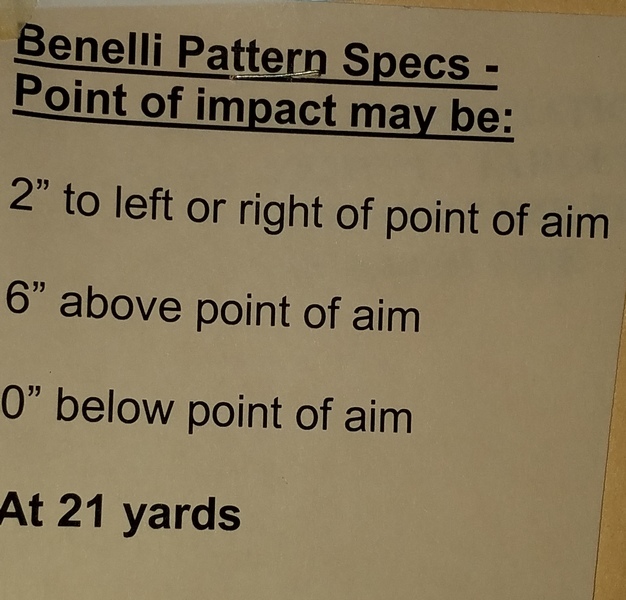 Now, Benelli's "new" bizarre standards (if you want to call them that) are 0 - 6 inches high at 21 yards, within 4 inches of the bull horizontally, also at 21 yards. You can call that type of attempt at a tolerance what you wish: I just have to call it a nasty mess, if not a tragic embarrassment. No one at Benelli can explain where the 21 yards came from in the first place: no one uses that for a 12 gauge, and why would they? Industry standards are 40 yards, and all shotguns unless otherwise specified should shoot to point of aim. I'm not a “barrel bender” by any means, my friend Tony Knight was, however. According to Benelli, they have tried the “barrel bending” routine on their current “Crio” barrels and it doesn't work. The folks at Benelli USA will do what they can, they can change barrels for you and perhaps improve things. But, Benelli USA has no control over what drops out of a machine in Urbino, Italy, and there is no fix and none planned . . . at least, according to Benelli USA. “I just read your excellent review of SBE 2 and 3 problems with shooting high. I pheasant in SD every year and have shot many pheasants in my 57 years of hunting. This last year was much different. Yes, it is unreal. I actually have the pattern which proves the gun shoots 95/5! It was shot at 21 yds. The gunsmith said it is within 6"s vertical and 2"s horizontal specifications after his adjustment, which he didn't describe. I really would like to discuss this with Benelli, at the highest level possible, any suggestions? Also, are there any Benelli autos that shoot good? I've spent far, far too much time patterning shotguns, but the ridiculous point of impact problems with the SBE3 are a new development. In times past, Benelli product has done quite well in extended comparisons with other shotguns, as you can see here http://www.randywakeman.com/A400vsBrowningMaxusBenelliVinci.htm and here http://www.randywakeman.com/AnOldComparisonBenelliSBEIIvsBrowningMaxus.htm . As many know, my favorite 20 gauge pheasant gun for many years has been a Benelli M2 20 gauge with a 24 inch barrel, and it shoots to point of aim at 40 yards. The problems with the SBE3's inability to throw a pattern where it is pointed is a miserable mess. I've had countless e-mails and phone calls about it from angry SBE3 owners and you can be sure that Benelli USA is well aware that most SBE3 owners who pattern their guns are loudly unhappy. Whatever they are doing over at Benelli in Italy, is sure isn't good. The folks at Benelli USA will do what they can. Currently, the top technical person at Benelli USA will ask for your serial number and will look up the work order to see what was done to it when it was there. Then he will give you a call after that and see what they can do to take care of it for you. That's all there is at the moment, Jim. Hopefully Benelli USA can improve things to the point with your SBE3 that you can live with. A couple of folks have reported that, after two or three returns to Benelli with no progress, Benelli USA finally gave them a refund on what can only be described as horribly defective shotguns. I cannot possibly recommend a SBE3 (and will not) until such time as Benelli decides to get their act together and rectifies this common, serious problem at the plant level. No honest person could. $1800 is far too much to pay to join the “Gang That Couldn't Shoot Straight,” but so is $500 for that matter. There is no indication whatsover that Benelli is going to change a thing, so some will just save their pesos and wait for the SBE4 I suppose. All I can do is put people in touch with the lead tech at Benelli that will do his best to try to help, as I've done for you. I hope it works out for you, Jim.